For me, undoubtedly the most heavily anticipated new album of 1994 was the new Motley Crue. Originally titled ‘Til Death Do Us Part, the self-titled ’94 Crue disc was their first with new singer/guitarist John Corabi. They holed up with producer Bob Rock and knuckled down, creating what could have been the most important album of their careers. 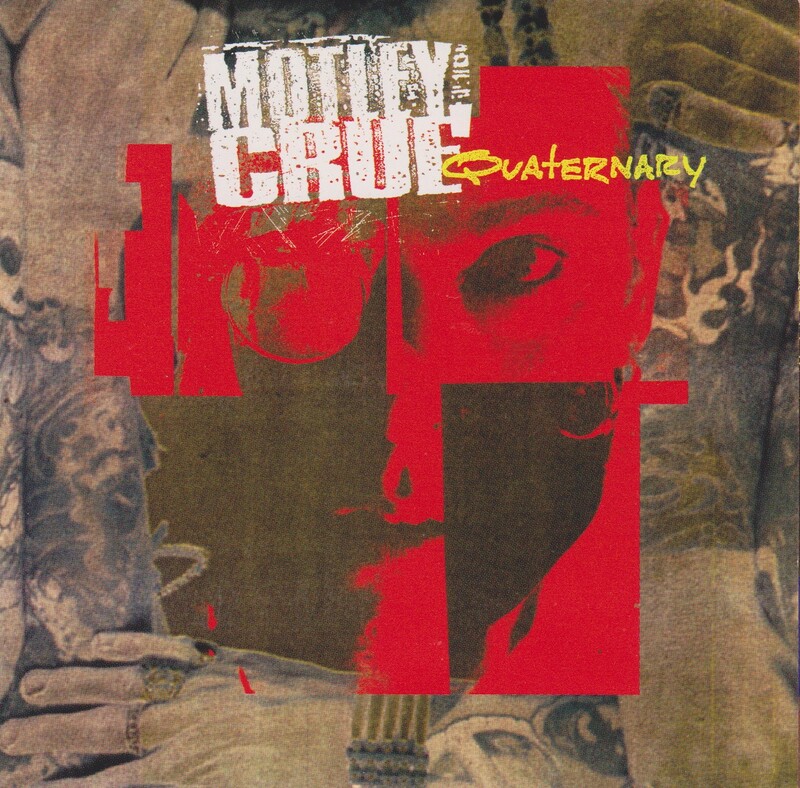 The long wait (five years between studio albums) and cryptic remarks from the studio indicated that this would be the heaviest Motley album ever, and their most ambitious. The new, serious Motley for the 90’s had, as always, written plenty of extra material too. In addition, producer Bob Rock had an idea for getting creative juices flowing. He asked each of the four members of Motley Crue to write and record a solo track with no input from the other members. This was slightly historic: the first time Nikki Sixx, Mick Mars, Tommy Lee or John Corabi had done anything solo. With all the numerous outtakes recorded for the Motley Crue LP, there was now plenty of extra material to put out as a bonus EP. A mail-away coupon inside the Motley Crue CD alerted fans that five more tracks were available by mail order only. 20,000 copies of the original EP were pressed. They included all four solo tracks and a new Motley Crue song called “Babykills”, featuring fifth Beatle Billy Preston on clavinet! Still, the lucky fans in Japan didn’t have to mail away for anything. They were able to buy Quaternary right on their store shelves, and because it’s Japan, they also got bonus tracks. The Japanese version of Quaternary was not a five song EP, but more like a nine-song mini-album. I had no idea such a thing existed until finding one at Sam the Record Man in Toronto in the summer of 1996. It still has the price tag: I paid $49.99, for a total of three songs that I did not have before. Today, every one of these songs can be found on the box set Music to Crash Your Car To: Volume II, along with even more bonus mixes. After a brief studio discussion with Mick Mars about hemorrhoids (? ), his blues instrumental “Bittersuite” blows your ears off. Motley fans know that Mick Mars is the most musically talented member, considered an underrated and under appreciated rock god. The blues-rock of “Bittersuite” isn’t as satisfying as I imagine a pure blues offering to be, but there is no doubting Mick’s talent here. Both as a writer and a player, Mick hit it out of the park (Chris Taylor played drums). Mick’s goal was to pay tribute to rock-blues greats like Beck, Hendrix and Blackmore. Mission accomplished. His guitar tone is beautiful and so are his emotive licks. Nikki Sixx goes third, with another industrial-metal cross. “Father” is one angry fucked up track. It’s heavy and direct, on-trend for 1994, and very abrasive. The riff and song are simple, but Nikki’s anger leaks through. “Father — where were you?” Backwards guitars, electronics and loops on top — you can tell Nikki and Tommy were listening to the same kinds of music at the time! New kid John Corabi goes last, and in the liner notes he says that “Friends” is his first piano song. He meant to go acoustic, but “Friends” just came out of him. It’s a pretty Queen-like ballad with lovely harmonies in the middle. Although Mick Mars’ song is probably a greater technical achievement, “Friends” is my favourite of the solo tracks. When a guy like Corabi gets going on a ballad, it’s usually going to be amazing anyway. Throw in the Queen elements, and I’m just a sucker for it! It’s really a shame that Motley did not continue with John beyond this. The potential for greatness was always there. After more studio chatter, we break into “Babykills”, the Billy Preston collaboration. “Babykills” is fun and funky hard rock, probably the heaviest thing Preston ever played on. Unfortunately his part is little more than an added topping. Great tune though; probably far too good to lie hidden away on an obscure mail-order EP. As mentioned, the Japanese had bonus tracks. These are tracks that did not make the finished Motley Crue album, since they had recorded so much extra material. “10,000 Miles Away” is a cool blues ballad, showing off more of Mick’s fine fingerwork. It was obviously too much of a standard sounding song to fit in with the experimental Motley Crue album. Not that the album stood a chance in hell after grunge cleared the decks, but you do wonder if it would have been better received if some of these more digestible songs were included on it. The one track on the Japanese release that is easy to skip is the Skinny Puppy remix of “Hooligan’s Holiday”. This track was already available on the “Hooligan’s Holiday” single and it’s since been re-released in other places too. It’s long — over 11 minutes. Dave “Rave” Ogilvie remixed it with Dwayne Goettel and cEvin Key, so it is of possible interest to Skinny Puppy collectors. The thing that bugs me about it is that it strikes me as lazy. The song is pretty much the same as always for the first three minutes, and then the remixing begins. The whacked out and frankly boring remixed part goes on for almost seven more minutes, before transitioning back to the standard song. In other words, what Skinny Puppy did here was edit out the middle section and guitar solo of the song, drop in seven minutes of remixed barf, and then put the ending back on. Two demos round out the CD: “Hammered” (which did make the album) and “Livin’ in the No” (which did not). The “Hammered” demo is structurally the same as the album version, no radical departures. It sounds like much of it is live in the studio, and it’s clear that Motley were focusing on grooves. It’s all about the four guys being locked in. Finally “Livin’ in the No” is in the standard hard rock mold. Again, a track like this fits in less well with the unorthodox LP, but might have made it more accessible for fans. Even so, a guy like Vince Neil would never have been able to sing “Livin’ in the No” and make it sound good. Get the complete EP including all Japanese bonus tracks on Music to Crash Your Car To: Volume II. That set also contains more remixes originally from single B-sides of the era: “Misunderstood” (Guitar Solo/Scream Version), “Hooligan’s Holiday” (Derelict Version), “Misunderstood” (Successful Format Version), “Hooligan’s Holiday” (Brown Nose Edit).